For the second day of National Poetry Month, I offer one of my all time favorite poems, “A Birthday” by English poet, Christina Rossetti. I often teach with this poem, because I know it by heart and love to look at the faces of young students when I’m reciting it for them. Nothing commands their attention better than a poem read from memory, a true performance. There are also so many visual images, and some strange and bizarre words that make us laugh (click through “vair” to see what I mean, poor Sciurus vulgaris). The poem lends itself to fruitful discussions of simile and metaphor, and is a convenient opening for a lesson about how our bodies have feelings that our minds sometimes are afraid to articulate. Drop me a comment about this poem, or share one of your own. 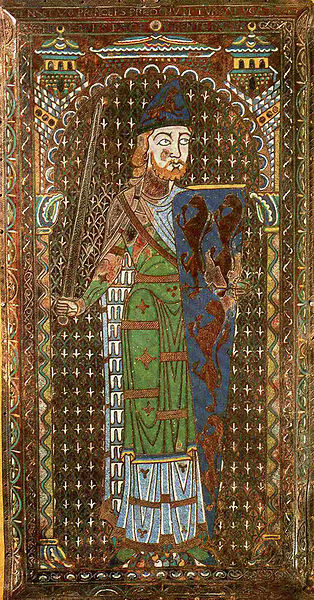 Enamel effigy of Geoffrey Plantagenet, Count of Anjou on his tomb at Le Mans Cathedral, wearing a vair-lined mantel.